If you've ever played a turn-based strategy game on the iPad, chances are you're playing a game with PC controls and/or design shoe-horned onto the touch-screen device. Some are OK, some can even be good, but you can never shake the feeling that you're playing a game wearing somebody else's ill-fitting shoes. Battle of the Bulge is different. It was designed for the iPad from the ground up. And is all the better for it. While it looks like a complex war game a la Hearts of Iron, BotB is actually relatively simple. There's two teams, you move one unit (or all the units in a single area of the map) then the opponent moves theirs, and there are objectives you have to meet. Combat is handled via number-crunching as you move units into enemy territory, and you're racing against the clock. This might make it sound like a larger, WWII-themed version of Advance Wars, but the real beauty of BotB is that it's a little more complex. You just have to look to see it. 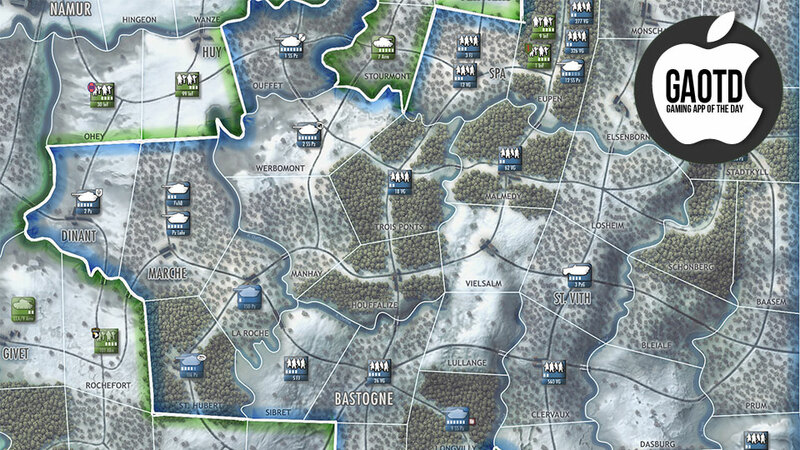 There are things like artillery and air support, but rather than making you call in each strike accordingly, units simply receive bonuses relative to the perk (artillery support is granted automatically within a certain radius, for example, while air supremacy can give one side a slight, constant advantage). One last thing worth mentioning is the game's AI. Instead of choosing a set difficulty, singleplayer missions ask you to choose your opponent, with each promising a different way of playing, some generals being cautious, others daring (with both having their strengths and weaknesses). BotB is a little pricey at $US10, but considering the scale and depth of the experience, it's definitely worth it if you've been looking for a satisfying strategy experience on Apple's tablet. Seems a little too high level for my tastes.. but good to see this style of game available. It certainly interests me enough to have a look.. just wish it was a lower level, like at the squad or company level..